My greatest real estate accomplishment is creating an app that agents and brokers can use for personal engagement. This helps their client retention, increases referrals and assists their successful marketing efforts. 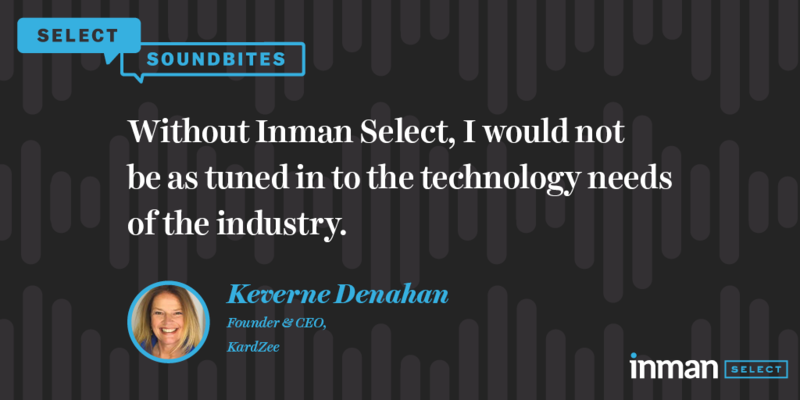 I use Inman Select to figure out what the industry is missing and needing. Using the many articles as well as opinion pieces helped KardZee identify what we needed to offer in our automated strategic engagement campaigns for both tangible and digital outreach. It’s money well-spent to find out what’s happening in the real estate tech and data world. Not be as tuned into the tech needs of the industry! Want to connect with Keverne? You can find her on Twitter and LinkedIn. Email Shawna Strayhorn, Director of Subscriber Growth, to share your Select Sound Bite!